Landscape architects deal with different dimensions of green – from small gardens to city parks to green structure systems connecting urban and rural regions. But size isn’t the challenge; it’s the search for suitable idea for each place. Within mega cities there is an enormous competition for space – for everyone and everything. In these areas green is much more important than elsewhere, yet it is part of the competition, too. So we need new ideas and new concepts for green spaces. Roof gardens are not a new idea – think of the hanging gardens of Babylon or the Kensington Roof Gardens. The green space located in the centre of London covering 6000m2 of roof already opened in 1938. 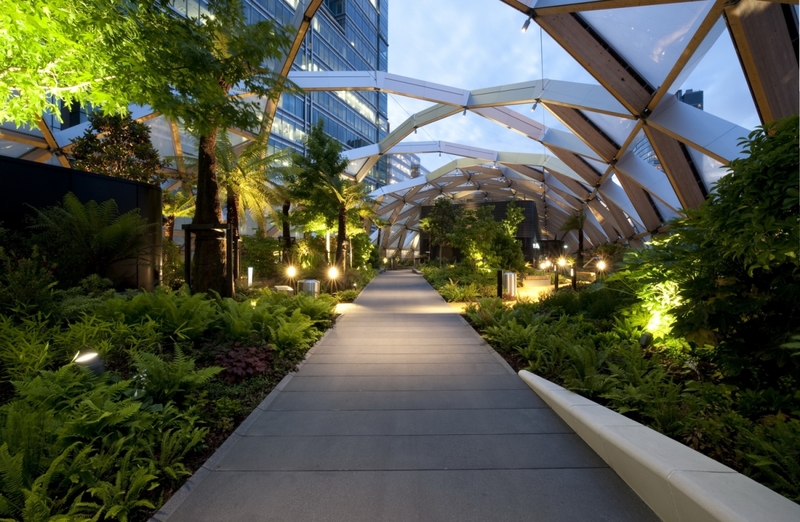 But rethinking roof gardens and connecting them with concepts for urban parks and architecture could lead to something new – and the Crossrail Place Roof Garden, situated on the top of the new Canary Wharf station – is one of the most vibrant examples of this. The seven-story structure, located in the heart of London’s Canary Wharf financial hub on the North Dock, is the first new building for London’s new east-west rail link. It was opened in 2015, although trains will start to run from the station in 2018. The world-renowned architects Foster and Partners have designed the roof structure and cladding that wraps around the four stories of shopping and leisure facilities above ground level, as well as the gardens on the top level. The roof garden, landscaped by London-based studio Gillespies, is located directly beneath a 310-metre-long transparent hood. Triangular air-filled cushions made with corrosion resistant plastic are set into the timber-latticed awning. The enclosed garden opens daily to the public from sunrise to sunset and sometimes even longer. It references both the history and geography of Canary Wharf, drawing on the area’s heritage as a trading hub. Also, many of the plants are native to countries visited by ships of the West India Dock Company who unloaded their wares in this very location 200 years ago. Crossrail Place sits almost exactly on the Meridian line and the planting is arranged according to which hemisphere they are from, with Asian plants such as bamboos to the east, and plants such as ferns from the Americas to the west. Information boards are placed throughout the Roof Garden explaining in detail about the plants within it. Nestled within the Roof Garden, is a 60-seat performance space that ignites the imagination of children and adults alike. So, the roof garden is more than a place for walks by men in suits during their lunchtime breaks, it is a place for everyone at any time. It could help to transform Canary Wharf into something other than a parched space after the office hours of the financial district. We would like to honour architects with visions, landscape architects with the right concept for the place and extraordinary plant skills and last but not least, all other professionals, taking part in the success.